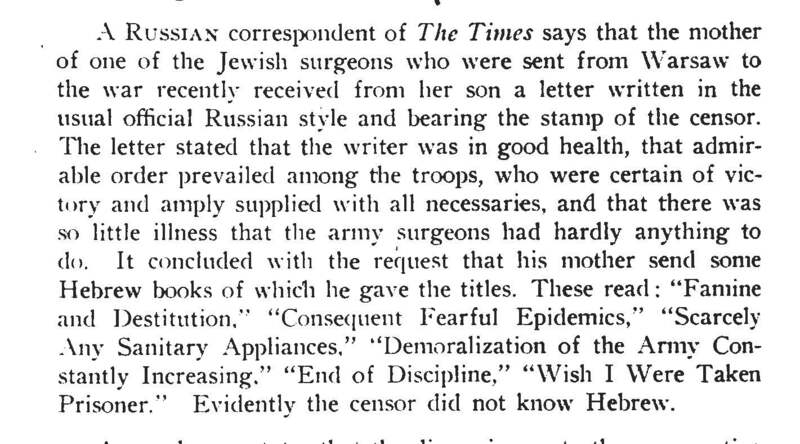 This short item tells how a Jewish surgeon in the Tsar’s army was able to trick the censorship and report gloomy news from the front during the Russo-Japanese War (1904-1905). It might well have been a joke or an apocryphal story, but it was published as a news anecdote in The Times (of London), that covered the war extensively. It does indeed have attributes of a Jewish joke: the protagonist is a Jew who was put under tragic circumstances; he is unable to escape these circumstances, only to win little victory by playing a trick on his oppressors. And of course, it starts with a Jewish mother. I was unable to find the original publication (if your library has a subscription to The Times archive you can give it a shot, but I found that the search engine omits many relevant hits). I found the text in one of the numerous newspapers around the English speaking world that cited this story verbatim over a period of at least five months: in the United States, New-Zealand, Asia, and even Africa, as well as in a couple of medical journals – after all, this was not just a Jewish story, or a story about the war, it was also a story about a surgeon. According to the earliest date in which this story was “retwitted”, it must have been published before May 23, 1904. It is reasonable to guess that the item is originated from April or May 1904, during the Blockade of Port Arthur and the Battle of Yalu River, when news coming out to the world have begun to make it clear that the Russians are facing an enemy that is not at all inferior. Many Jews served in the Russian army during this war, and more than three thousands of them paid with their lives. To give a sense of the magnitude of these losses, there were more Jewish casualties in this war than in the 1973 Yom-Kippur War. As Yohanan Petrovsky-Shtern showed in his book on the Jews in the Russian army, despite widespread accusations to the contrary Jews reported almost fully when drafted and did not perform short of their fellow Russian soldiers. The theme of Jews and war censorship was used during the early months of the war by the notoriously anti-Semitic newspaper Bessarabets, published in Kishinev by Pavel Krushevan. The hard and hostile line of this newspaper had been instrumental in fomenting anti-Semitic agitation that led to the 1903 Kishinev Pogrom. When the war broke out, new accusations could be made: Jewish soldiers were deserting the battlefield; Jewish bankers were funding the Japanese war effort (the latter was not unfounded); and Jews were leaking intelligence to the Japanese. ← The King is Dead, Long Live the… Wait, is it Good for the Jews? Was This Saul Bellow’s First Published Piece?